As we head into the new year it’s a good time to check your ASPS membership is up to date. Login here to check when your current membership is paid to. You can use your ASPS login or the e-mail address this newsletter was sent to. You can also request a new password be sent to you. The December issue of Phytogen is available here. In autumn, it is not only the colours that catch the eye, but also the different sizes and shapes of leaves. But what makes leaves of different plants differ so much in their shapes? Scientists have now discovered how a protein called LMI1 can control leaf growth and shape. Researchers have discovered that a fascinating plant employs two mechanisms to survive, no matter where it grows. New research, published in New Phytologist, looked at Aethionema arabicum, also known as “stone cress”, and found the plant is unique in its seed and fruit dispersal strategies. Diverse communities of plants and animals typically perform better than monocultures. However, the mechanisms that are responsible for this have so far been a mystery to science. Biologists have now been able to identify the genetic cause of these effects. Their findings might help to improve crop yield. With scarce nutrients and weak gravity, growing potatoes on the Moon or on other planets seems unimaginable. But the plant hormone strigolactone could make it possible, plant biologists have shown. The hormone supports the symbiosis between fungi and plant roots, thus encouraging plants’ growth – even under the challenging conditions found in space. 31 January 2019. Montpellier, France. GPC is gathering job opportunies and posting them in our social media accounts, either on our devoted Facebook group or using the #plantscijobs hashtag on a Twitterstorm one Friday a month from our principal Twitter account. Please, join either to be informed. Next Twitterstorm will take place on the 21st December between 3 and 4 pm CEST. Other potencial funding bodies to be found here. Click here for details of the GPC Member Societies and their representatives. Please contact us (isabel@globalplantcouncil.org) to find out how your organization can join the Global Plant Council. The GPC is a coalition of plant and crop science societies and institutions from across the globe. The GPC seeks to bring plant scientists together to work synergistically toward solving the pressing problems we face. Please click here to make a donation via PayPal to help support the GPC. Copyright © 2018 Global Plant Council, All rights reserved. You are receiving this email because you signed up to receive updates from the Global Plant Council. If you no longer wish to receive the monthly GPC E-Bulletin, or think you have received this email in error, please unsubscribe using the link provided.The Global Plant Council is a not-for-profit entity registered in Canada. as promised, Beth Loveys has provided an article below on Biochemistry education we hope you will enjoy reading. ASBMB Education Feature PAGE 20 & 21, AUSTRALIAN BIOCHEMIST VOL 49 NO 3 DECEMBER 2018. 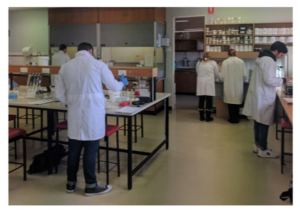 Making the Most out of the Precious Face-to-Face in Biochemistry Practicals, Beth Loveys and Chris Ford, School of Agriculture, Food and Wine, University of Adelaide. We all know that the time we spend face-to-face with students is invaluable for their learning and, as teachers, we are always searching for ways to value-add to face- to-face sessions. One approach that has worked for me in a second year biochemistry course is ‘flipping the laboratory’. Fortunately, this doesn’t mean turning the lab upside down! Instead, I prime the students with relevant information and methods before they come to class so that the in-class time can be used more effectively. Central to flipped classroom pedagogy is the idea that pre-class learning should introduce foundational concepts and focus on the lower ‘remember’ and ‘understand’ levels of Blooms Revised Taxonomy. Biochemistry students working in the laboratory. Animal and Plant Biochemistry II has a reputation for being content-heavy and difficult for many students. Over the last eight years, my colleague, Associate Professor Chris Ford, and I have initiated many changes to the course aimed at reducing the ‘fear factor’ and making biochemistry more accessible and relevant. One of these changes has been the implementation of online, pre-practical activities. All teachers hope their students will arrive in the laboratory prepared for the class; the reality, of course, is that students are often not prepared and are therefore disengaged and confused. Many students do not read the relevant material in their laboratory manual – this makes it difficult for them to form the link between theory and application. To address this problem, I developed interactive, online pre-class activities, thus ‘flipping the laboratory’ to encourage students to prepare. Using this approach, I have developed pre-practical online activities for my students on many topics: enzyme kinetics, photosynthetic reactions and carbohydrate metabolism. The pre-practical activities provide students with examples and interactive activities including video demonstrations of relevant lab techniques. Check-point multiple choice questions with unlimited attempts help students gain confidence. Understanding foundational concepts is critical for deeper learning. Once students are engaged in a course, it is easier to maintain their interest in difficult and challenging content. I have found that in class, we now have more time for solidifying the link between theory and practice. Students have been surveyed each year since these pre-class activities were implemented and feedback is extremely positive: 85% of students felt they were better prepared for practical classes after completing the activities and 90% felt the check-point questions clarified areas of confusion. The average mark for the practical component of the course increased from 70% in 2011 (pre-flip) to over 85% in 2018 (see figure). As teachers, we hope to inspire students to discover knowledge for themselves. Providing an environment where they feel safe to try techniques that help them understand the theory presented in lectures is a great start! We are hopeful that, as a consequence, our students come to see that learning is a process, not simply a means to an end. After completing two postdoctoral positions in the UK and ACT, Dr Beth Loveys took up her position as a teaching focused academic in the School of Agriculture, Food and Wine at the University of Adelaide in 2011. Beth teaches across a diverse range of courses including Animal and Plant Biochemistry, Foundations in Plant Science, Viticultural Science, Introductory Wine Making, and Plant Production and Global Climate Change. In 2015, Beth was awarded an OLT citation for Outstanding Contribution to Student Learning, and in 2018, was awarded the Australian Society of Plant Scientists Education Award. Associate Professor Chris Ford is currently Interim Head of School in the School of Agriculture Food and Wine. Prior to this, Chris was the Head of Learning and Teaching, and also has an active research laboratory examining the biochemistry of flavour compounds in wine. Ask your colleagues, teachers and students to send articles to the websites and communications team for publishing on Phytogen. Tweet to @asps_ozplantsand facebook, https://www.facebook.com/ASPSozplants/. Over the holidays login in to check where your membership is up to and make sure you renew and encourage your students to join. We wish you all the best for Christmas and a safe and Happy New Year. ASPS 2019 and Grains Satellite Meeting registration and abstract submission open NOW!